The fourth quarter of 2016 GDP data is coming up for a second revision today at 0900 GMT. Economists polled expect to see no revisions to the GDP, which currently stands at 0.6% on a quarterly basis, while preliminary business investment is expected to remain flat, following a 0.4% decline previously. The unchanged print is expected to confirm that the UK’s annualized GDP expanded at a pace of 2.2% in the three months ending December 2016. The data from the UK's Office of National Statistics (ONS) is expected to confirm the quarterly GDP expansion of 0.6%, unchanged from the initial estimates. The data could be seen as a positive for the UK, which ends the tumultuous year 2016 on a positive note, despite the June 2016 vote to leave the European Union. However, there could be some downside risks to the annualized GDP, which sits at 2.2% as quarterly exports are expected to rise only 2%, from 2.6% previously while imports are also expected to rise just 0.3% from 1.4% previously. Given the downside surprise expected in the imports/exports, there is scope for the annual GDP to dip lower, which could be a bit bearish for the GBP. 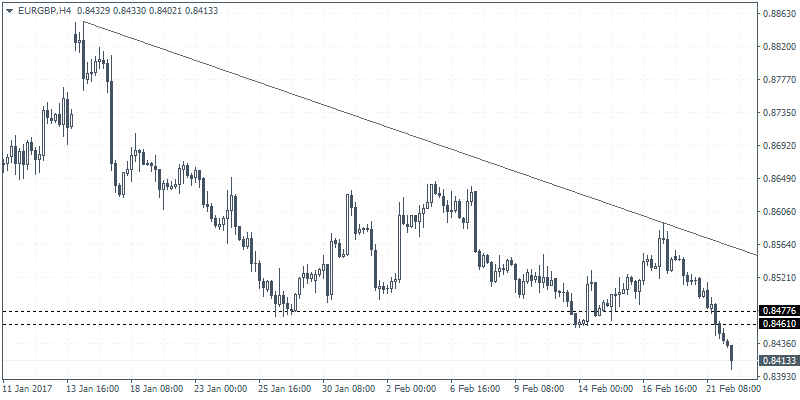 The EURGBP has been extending strong declines with the euro coming under pressure due to the political uncertainty in the region as major economies such as Netherlands, Germany and France head to polls this year. Furthermore, Greece’s debt crisis has once again made a comeback adding to the weakness in the single currency. The outlook for EURGBP remains bearish and thus it is better to wait for a pull back towards 0.8461 - 0.8477 to purchase daily PUT options. Price action shows the break out from this aforementioned support level which marked the descending triangle pattern and could see further declining coming over the next few days. Therefore, purchase EURGBP PUT options at 0.8461 – 0.8477 for a 21:00 GMT expiry time.